The Hesperiidae are more usually known as "The Skippers" and so far we have found four types, the dingy, grizzled, the large and the small. This butterfly appears at Quoditch in June and stays until late July / early August. 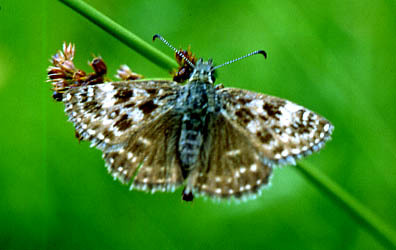 It has a wingspan of about 33 mm and is quite common. We can find these over a lot of our land, but mainly they appear in field four, our "butterfly field"
It can be found in the majority of England and Wales and right across Europe and Asia to China and Japan. 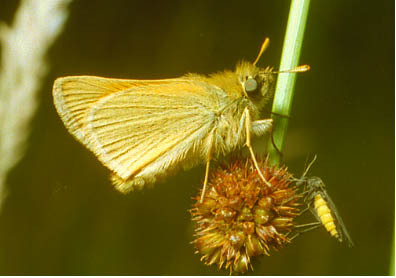 The Small Skippers follow on from the large ones, appearing in July and carrying on until the end of August and are very common on our land. 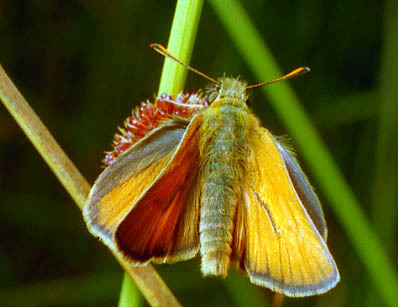 They are slightly smaller than the large skippers, being about 30mm in wingspan. They have a most beautiful lustre to their wings and a black bar across the middle of the wings. Photographs don't really do them justice. 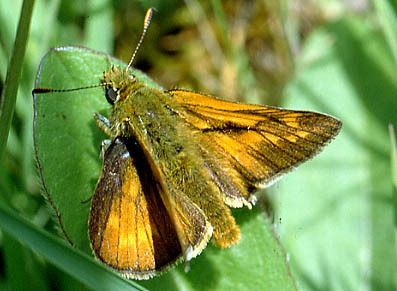 Small Skippers can be found over most of Europe, as far south as Morocco but only go as far up as the North of England. We found this one in field three in June. They appear from the beginning of May until mid June and have a wingspan of 27mm. So far at Quoditch we have only found a few of these. (by the way, this isn't found at sea in a boat!). It can be found in most of England, parts of Scotland and Ireland, thence right across Europe to Russia, Siberia and China.